Thanks, Mail Carrier | The ABC Kids Expo, HABA and me. Part 2. 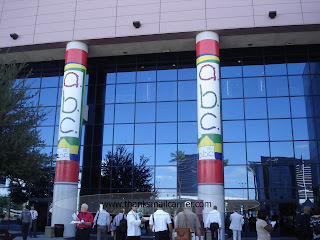 Walking up to the ABC Kids Expo, in my mind I was thinking Okay, sure, this looks like a big place. But unless you've been there, it's hard to explain what it looks like when more than 900 exhibitors have their innovative products displayed across nearly 1 million square feet of floor space. It really is hard to wrap your head around the fact that it just keeps going and going... and when I thought I saw where the end was, there were actually a few small steps leading to a whole separate section. And that was just the first floor. 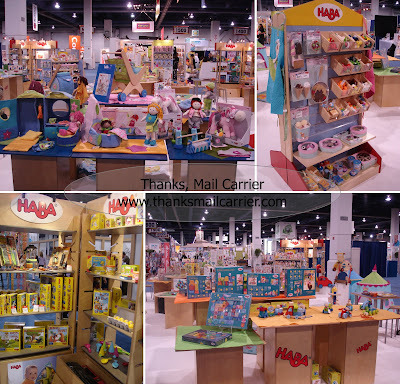 Being at the HABA booth was, like I mentioned, an amazing experience. From the moment you walked up and saw the clean, crisp displays filled with colorful, high quality toys, it just felt like... fun. It was great watching people's eyes light up when they approached the HABA booth, trying to look in all directions to take in the wonderful sights. Even better, nearly 100% of the time that I asked someone, "So, are you familiar with HABA?" the answer was always an emphatic head nod and something along the lines of, "Oh, yes. We're big fans." Chatting about HABA toys to visitors from all over the world really was easy and, as well as being fortunate to have tried out and played with some of the wooden toys, games, pretend play and baby toys that were on display, there was also a wonderful array of classic and new items that were great to see. Is there a child out there that wouldn't have endless imaginative fun with the award-winning Shopping Cart Caddy? The possibilities are limitless and the quality ensures that this could be played with and passed on to future generations. 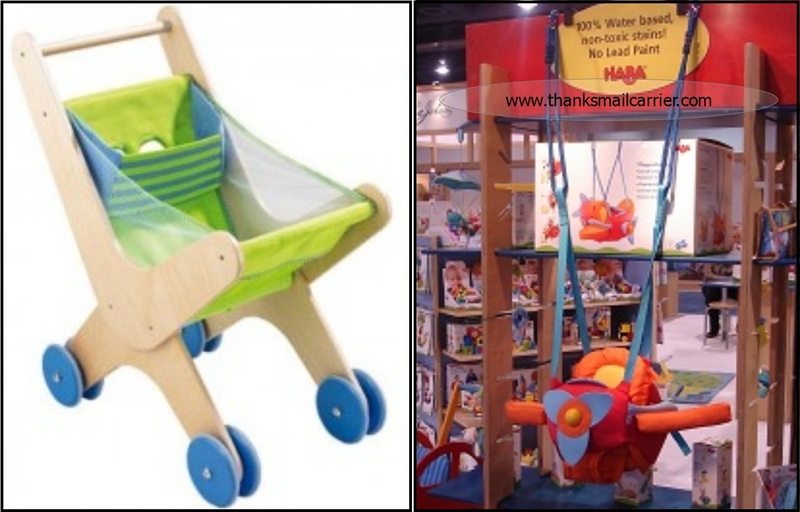 Or, for another incredible gift, the new HABA Aircraft Swing is just about the coolest new ride around. With adjustable straps and a seat that can adapt from small to large (it holds up to 66 lbs!) I'm pretty sure I'd love one in my size as well. Always a big hit, the selection of play food on display brought quite a few ooohs, ahhhs and smiles as people couldn't help but go in for a closer look. I'm sure that HABA wasn't the only company that had pretend fruit and vegetables at the Expo (although, actually, offhand I can't think of any others that I noticed), but there sure weren't any that were as unique and fun. I mean, really. Where else is a child going to put together their own Sandwich Baguette, serve up some Black Forest Gateau or Pancakes with Chocolate Syrup or detach the drumsticks from their Grilled Chicken? It wasn't any wonder that buyers wanted to make sure they had HABA's food in their stores, they are the perfect holiday gift! But the most common area that impressed and thrilled visitors the most had to be the beautiful collection of wooden clutching and teething toys. As an amazing gift for a newborn or as a present all year-round, the days of cheap, plastic baby toys have passed. We all know that babies like to grab and hold things, as well as put them in their mouth, and HABA makes it possible to give safe (the gorgeous colors are from 100% water-based non-toxic stain), playful, incredibly high quality items that babies and parents alike will love. The Buzz Buzz and Sunni Clutching Toys are adorable, but I have to admit that I was partial to the Magica Clutching Toy myself. It fit perfectly into my hand and the way that the balls roll and move together reminded me of a stress-relief item... which, every mom knows, is something that parents can definitely use. Every once in a while there was a lull in visitors to HABA's booth, so... can you blame me for wanting to play with the toys a little bit? Two hot new items that are going to make a splash this holiday season (seriously, if you need a gift, these are both a lot of fun) are the Technics Wooden Blocks and the Arranging Game Corner to Corner. Combining spatial thinking, perseverance, fine motor skills, cause and effect, cognitive development and creativity, the Technics Wooden Blocks are made of smooth beech wood and resemble traditional wood blocks (and are available in a smaller set as well as the large). However, by including the unique connectors and wheels, they can instantly be turned into buildings, automobiles or pretty much any other desired form. What a great twist! Or, for a simple yet addicting product, the Arranging Game Corner to Corner includes 62 tiles of various colors that are reminiscent of a Tetris video game. Whether you arrange them flat (an adorable little girl at the Expo walked right up and used 8 pieces to makes a perfect square, nodded at it contently and then proceeded to follow her parents further into the booth) or upright, the end result will be different every time. I had a great time building a few elaborate towers when things were slow! From a new Pure Nature Organic Collection (which includes two sweet dolls, the Guardian Angel Tine and the Guardian Angel Toni) to a pair of eye-catching Caro Lini and Pirates Treasure foldable play tents that every child had to try out, HABA never ceases to amaze me. Plus, as well as having incredible items, while I was in the booth I learned more about the company as a whole and their sustainability and green practices. Over in Germany (where nearly all of their beautiful wooden toys are made) the factory does things like use the scraps of wood in the furnace for heat or collect the rainwater. And each toy is of such high quality because the grandchildren of the original creator, the Habermaaß Family, still play with them so nothing less with be accepted. Oh HABA, can it get any better? So there you have it. 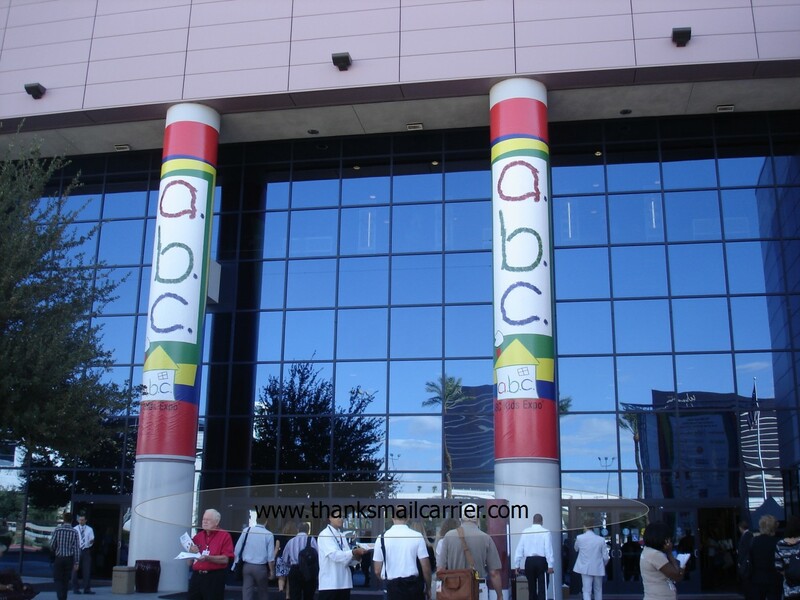 The ABC Kids Expo, HABA and me. There's more, because there will always be more, but what it comes down to is that HABA is the top of the line when it comes to kids. 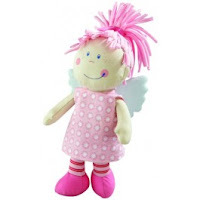 Their wooden or plush toys, inventive games and stylish furniture and decor are items that any parent can feel good about giving to their child or as a gift. For easy shopping and the largest selection available, check out their website, Maukilo, and know that everything you'll find will always fit perfectly with the theme: "Buy Once. Play Forever." This holiday season and all year round, don't miss out on the chance to bring joy and excitement to the children in your life with amazing HABA gifts! Hi I'm a new follower. I love your blog! You've always got something fun going on over here!! Thanks for sharing your experience. 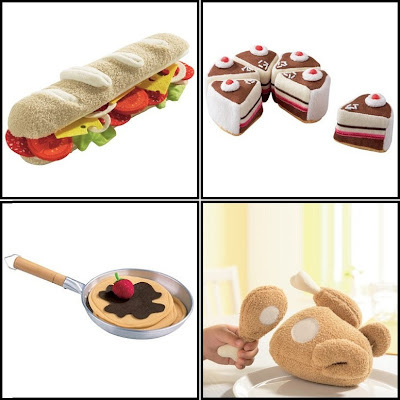 That is the most adorable play food that I have ever seen! I'm putting that on my daughter's Christmas list for sure! I love their toys! And holy moley, looks like you had a wonderful time! The airplane swing is adorable, and 66 lb weight limit is crazy. My little sister is 7 and weighs 42lbs. She's a tiny little thing, but someone like her could use that swing until they were 10. lol. Crazy!